As you could probably tell from the reviews during this Dystopian August, but I really love reading dystopic/post-apocalyptic novels. I know that some think of it as a phase or a trend, but there have been really wonderful dystopic books around long before the popularity of The Hunger Games and I'm sure they will continue to be published and read long after this 'trend' passes. Here are some of the books on my wishlist, as well as some of the dystopic books I have unread on my shelves. 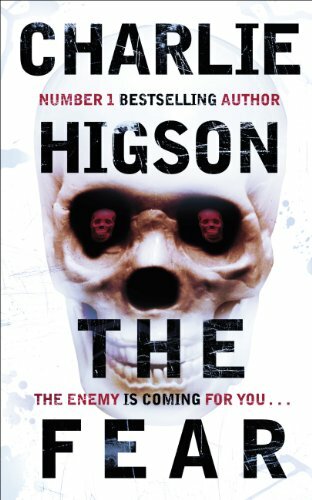 The Fear by Charlie Higson - I'm in the middle of reading The Dead by Charlie Higson, which is the prequel to The Enemy. I'm not entirely sure yet where The Fear fits into the series, but I don't really care. I love these two book so far, and am really looking forward to reading more about zombies and survival in London! Luckily the wait for this book won't be very long, as it is set to be published 15 September. The Pledge by Kimberly Derting - I've been a huge fan of Kimberly Dertings series of books, the Body Finder series, with both The Body Finder and Desires of the Dead ranking very high in my list of top reads recently. So it's with great excitement that I look forward to Kimberly Derting's latest offering, the story of a rather opressive world in which the language you speak holds the key to your position in society. It is being published in the US in hardback on 15 November and I'm dying to read it. 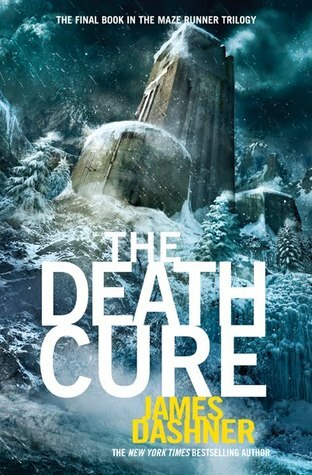 The Death Cure by James Dashner - It's taken me awhile to read and be swept away by this Maze Runner series by James Dashner, but because of this year's Dystopian August, I've finally succumbed. I absolutely adored The Maze Runner and ordered the sequel, The Scorch Trials immediately after finishing. 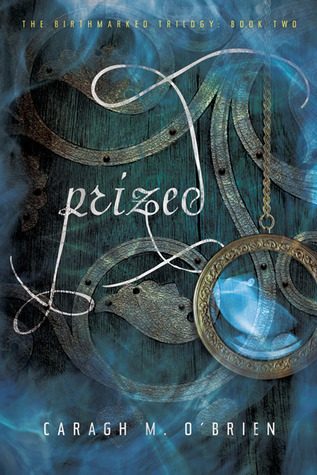 While I haven't yet started The Scorch Trials, I'm still excited and looking forward to reading more of this story. Bring it on. All These Things I've Done by Gabrielle Zevin - I don't think I've ever been as excited by a storyline as much as I have been about Gabrielle Zevin's latest! Living in a world where coffee and chocolate are illegal would be enough to make me perk up. But then we're also told that the main character's family are involved in the illegal trading and manufacuring of the illegal items and that makes me sit up to take more notice. 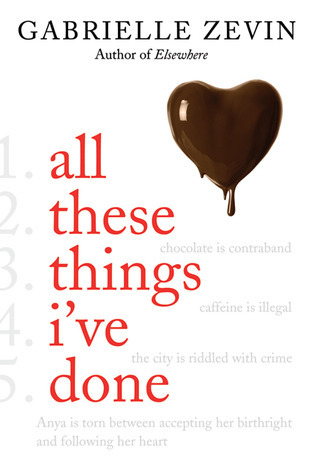 Falling in love with the enemy, having an ex who dies from chocolate, being blamed for murder. Holy crap, this book just sounds incredible. I really must order it straight away! 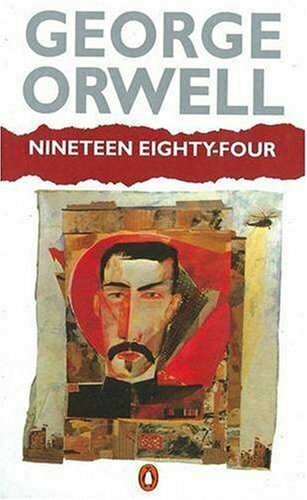 Nineteen Eighty-Four by George Orwell - Do you know embarassed I am that I STILL haven't read Nineteen Eighty-Four?! It's the book that's been sitting on my shelf maybe the longest and it's the biggest that I tell myself 'I'm going to read this book SOON' and it never happens. I admit that I have tried several times to start it but I blame bad timing and self-imposed pressure for not continuing with it. I really do want to read this book though and experience firsthand all the things I've only heard about second-hand, like Big Brother and Room 101. Soon, I promise you. The Year of the Flood by Margaret Atwood - I really do adore Margaret Atwood, and I especially love her dystopic books. I absolutely loved The Handmaid's Tale and I really, really enjoyed Oryx and Crake. 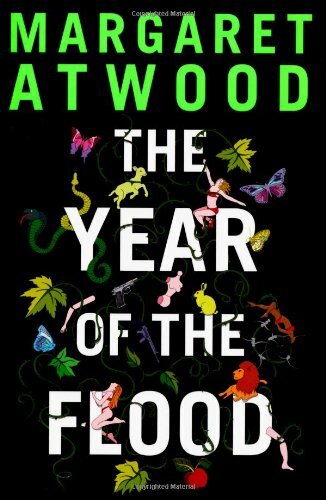 So when I heard about this companion novel to Oryx and Crake, I immediately went out and bought The Year of the Flood in hardback. And it sits there on my shelf waiting patitently for me to get around to it. I think perhaps this blog is the biggest factor in my having not read it as yet. I don't often read books other than YA and I feel overwhelmed sometimes at the amount of YA books on my TBR shelves and tend to ignore my adult fiction books. Which is a shame, as I'd really like to see how the story turns out. 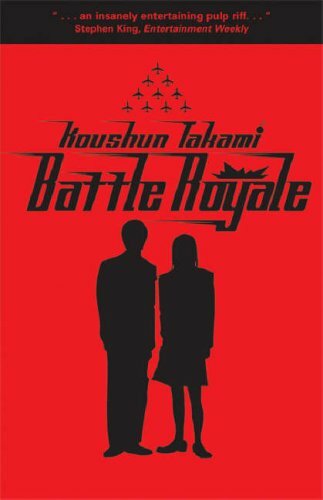 Battle Royale by Toushun Takami - I have been hugely excited about this book as well. I've heard that it's excellent and really exciting. There's been a movie adaptation and a manga series. And yet, something about it makes me a little bit put-off from reading it immediately. I think it's the sheer size of it. And while I've been making huge strides lately into my irrational fear of chunky books, my intimidation of 500+ has not yet been defeated when it comes to this book! And that's it for me! I would love to know if there are any dystopic/post-apocalyptic books on your wishlists? I read 1984 at school. I suppose it is the Godfather of Dystopian Fiction really. I haven't heard of some of those on your wishlist, so I will definitely look out for them. I haven't read any Margaret Atwood yet, so I do hope I get around to her books soon. I completely agree about dystopian fiction being around for years to come, I remember having to read one in school when I was about 12 so it's definitely not a phase (though I think the high proportion of dystopian novels is probably a phase and will drop off again). I love the sound of All These Things I've Done, might have to keep an eye out for that appearing in the library. Vivienne - I really do keep MEANING to read 1984 and it gets put off every time. Sigh. I really do love Margaret Atwood, though I've only read a few of her books so far..
Jenni - Oh I know, there aren'tusually THIS many about, but still. I think a good dystopic novel can really open eyes, so I hope it isn't a passing trend. Liz - Oh I'm definitely waiting on Insurgent and Pandemonium as well. If I had found covers for either of them, I'd have included them. I'm hoping to write up my review of Birthmarked before the month has finished, but I've been slacking way more than expected this month.. These Things I've Done sounds amazing! I cant wait for that one! Raimy - I've tried SO many times to read 1984 and it's just never stuck. I never pass a certain page. Bad timing? Or is it just a book I will never read? !